We did some rock-hopping on this leg of our trip. 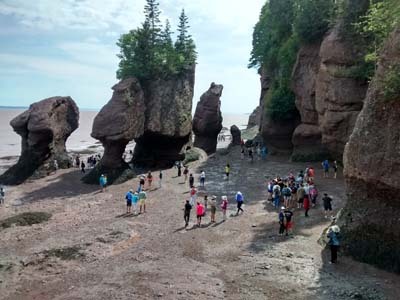 Over the course of four days, we were in three different provinces, too: Quebec, New Brunswick, and Prince Edward Island. So you might say we were province-hopping as well. 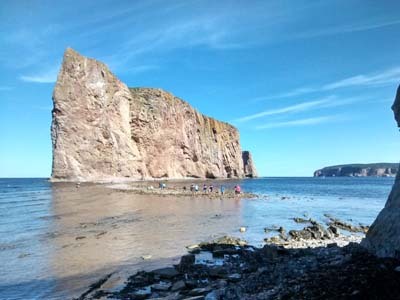 Our last must-see destination on Quebec's Gaspé Peninsula was the most iconic symbol of the Gaspé - Percé Rock. 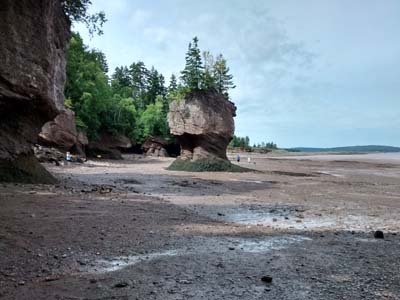 We enjoyed many views of the rock, including one from the ocean floor; we were able to walk right up to "The Rock" at low tide. 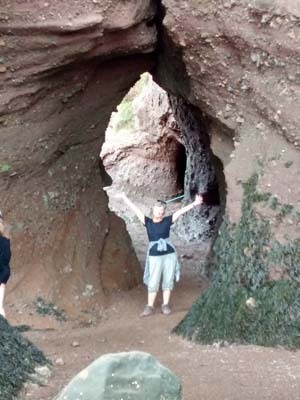 We waded through a bit of ankle-deep water and, although not recommended as safe (due to frequent rockfalls), we followed the many other visitors to find the opening in the fence and the steep, narrow footpath. The natural arch in the rock was not visible from there. We did see it from the overlooks on our way into and out of town. 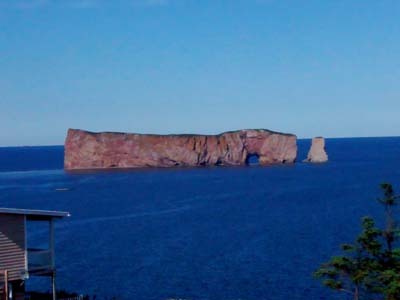 Percé was the setting of early meetings leading up to the birth of the Quebec Separatist Movement. We'll have to look for the movie that depicts it, which was filmed here. 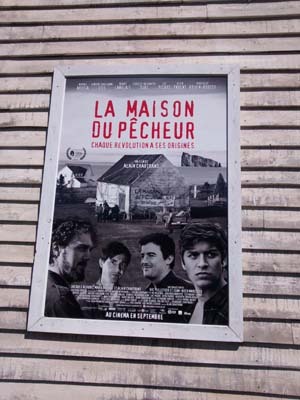 (Hopefully, we can find it with English subtitles). 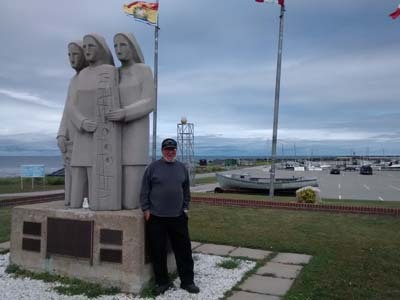 We crossed into New Brunswick at Campbellton and, following the tourist guide, we stopped in Escuminac to learn the history of a fishing boat disaster here in the '50s. Instead of the free museum and signage we expected to find, we were treated to a personal 45-minute tour by the local dock master, Robert Martin. He was wonderful and educated us about lobster and other fishing here on the St. Lawrence Coast of New Brunswick. 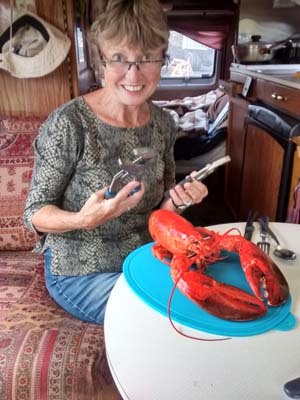 Our first lobster meal of the trip. Will these tools do? 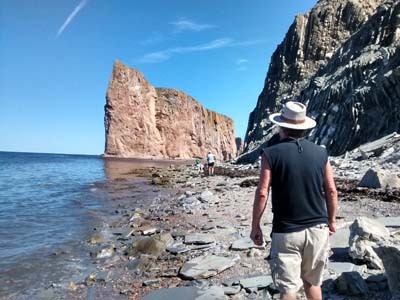 Magnetic Hill had been on Randy's bucket list since he wrote a paper about New Brunswick in grade school. All we wanted was the experience of the illusion, which normally requires payment of af $6.00 fee. However, a gal at the visitor center told us that before or after the park's hours we could access the hill for free. We had camped nearby, arrived before 9 am and were able to roll "up the hill backwards" four times before even one other vehicle arrived. 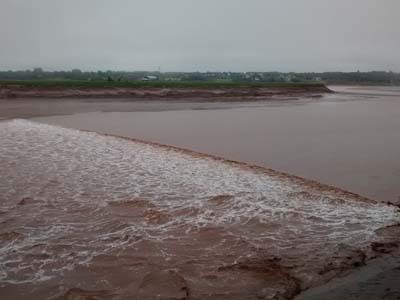 We also managed to see the tidal bore on the bay of Fundy in downtown Moncton. 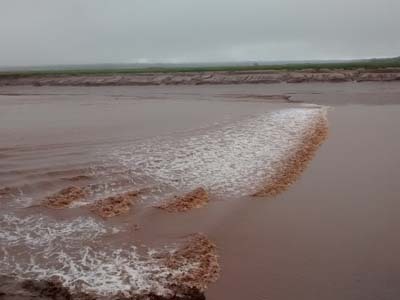 The muddy flow of the river at low tide, reversed with the bore to flow in the opposite direction. A pretty cool phenomenon to witness. 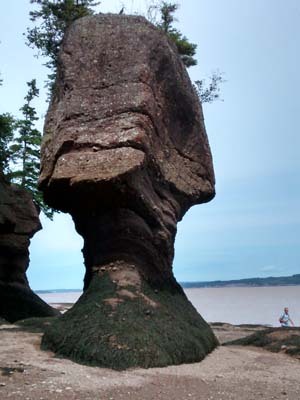 We made our way to Hopewell Rocks to witness the highest tides in the world! 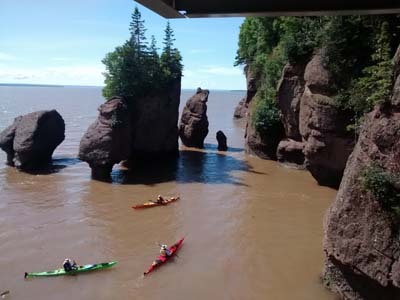 At high tide, we watched kayakers float between the flowerpot-shaped rock islands. At low tide, we descended to walk the ocean floor between these formations. Kayaking requires a guided tour at a substantial cost ($69 per person for about an hour) but we discovered later that we could have launched our own kayak for free. 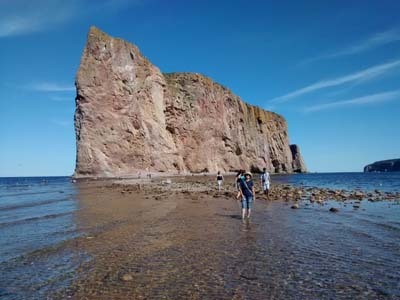 Since we plan to return this way after we visit Prince Edward Island and Nova Scotia, we hope to do that. Now we're off to P.E.I. on Confederation Bridge. 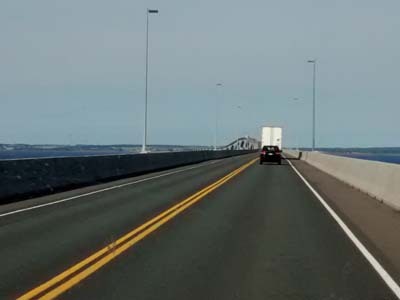 There is no toll for driving across this bridge to get to P.E.I. However, much like "Hotel California", where you can check out any time you like, you can never leave the island (without paying). There are two routes off the island - the bridge at $46.00 is a bargain compared to the ferry where the lowest fare is for a car with one adult passenger - $91.00. 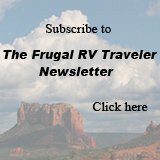 All our nights on this leg of the journey included free camping. In Carleton-St.-Omer, Quebec we noticed 4 other campers already set up in the Catholic church/school parking lot and joined them. 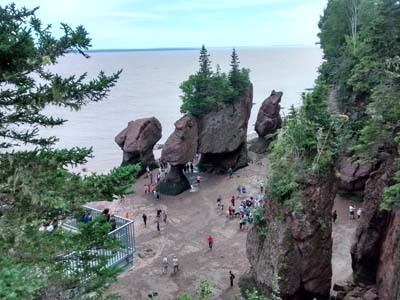 Our first night in New Brunswick was spent visiting friends where we parked overnight on their gorgeous ocean-front property, and the last night we spent with Boondockers Welcome members, Gadget2, conveniently near Magnetic Hill in Moncton.